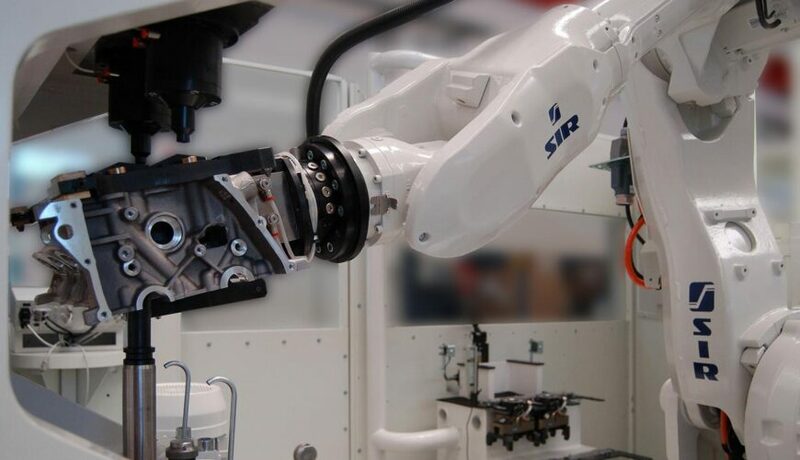 From chassis welding to engine assembly, from the machining of transmission subassemblies to the handling of components: an overview of the Automotive applications on offer from SIR Soluzioni Industriali Robotizzate. The Automotive industry is famous for being the historic cradle of automation: only a few decades passed between Henry Ford’s invention of the assembly line and the introduction of the first welding and painting robots. It was in 1969, the year of the first moon landing, that articulated robots made their grand entrance into the automotive industry. Since then, automation in the industry has progressed in giant strides, and the keystone of this process of continuous innovation has been ever-increasing systems integration, fostering the transition from rigid lines to more adaptable solutions. New applications, with high value-added, have gradually been added to the long-established welding and painting sectors. SIR Soluzioni Industriali Robotizzate was one of the first integrators to grasp the potential of the new robotics, ranging across all types of operations while always keeping a weather eye on the key principle of flexibility. In dozens of applications on core car and motorcycle components, SIR’s know-how has reached peaks of international excellence. We start our journey through the various Automotive applications starting from the car’s skeleton: its chassis. SIR has built automation systems for welding and assembling the aluminium chasses of sports cars, where the skilful combination of different technologies has brought excellent results. 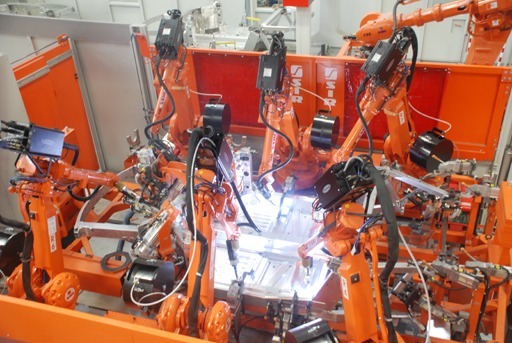 These lines feature a large number of parallel robots for welding the subassemblies, including the front and rear parts of the chassis, the side components and the central tunnel. Assembling the central tunnel requires highly complex operations, because welding is combined with the use of adhesives to secure aluminium components, and the robotic insertion of Ejot screws. Once the subassemblies are complete we come to the heart of the application, comprising a central track motion system that conveys the complex equipment on which the chassis is located through the stations. 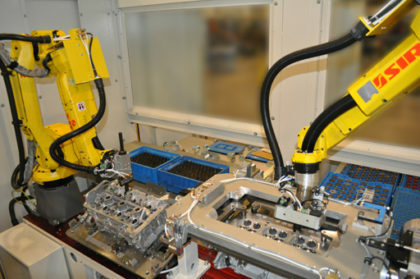 A handling robot picks the components and places them on the track motion system depending on the type of operation required. The first step for the tunnel is a halt in a polymerisation furnace to dry the adhesive. The track motion system conveys the chassis into a workcell with 6 robots moving in synchrony, which weld the side and front parts. The chassis is then collected by the handling robot, the line’s real “operative”, which places it in an automatic measuring unit where any dimensional defects are detected. It then moves on to another workcell, also with 4 parallel robots, where the rear part and the linking cross-member are fitted and welded. The line ends with 2 manual machining stations where the operative can give a number of finishing touches. It is important to realise that this automation system delivers considerable savings in production times and costs. As our journey continues, we shift our attention to the heart of the car: the engine. Playing the R&D role of a racing department in robotic terms, SIR has produced several plants for machining and assembling the cylinder heads produced by the top automotive and motorcycle manufacturers. 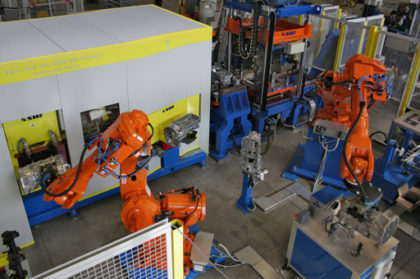 The first phase of the process is undertaken by a system using up to 5 articulated robots to deburr the head contours with fixed air tools, polish the intake and exhaust passages, inspect the components’ dimensions with mechanical or optical instruments, and tend the machining centres and flushing units. The robots then heat the heads in special furnaces and cool the valve seats and guides in liquid nitrogen (-196°). After loading the head in a special press, various robots fit the seats and guides by the driving method, based on the expansion and contraction of metals when they are heated and cooled. After a few seconds, as the temperatures return to normal, the components are securely locked in place in the head. But this is not all: SIR has also moved into the even more complex, prestigious assembly of intake and exhaust valves, followed by operating and tightness tests, through to automatic certification of product conformity. On other plants, the assembly and screwing-down of additional components, such as the cam shaft bearing covers, dowel pins and caps, is also performed by robots. The most amazing thing is that these systems, designed to process with single-piece lots, can be switched to new jobs in a few tens of a second. Once they have recognised the cylinder head model by means of a vision system, the robots retool the plant, ensuring that the right components are fed, modifying the thrust parameters for the driving operation, and replacing their own end-effectors. This makes them real “mutating” assembly systems, which ensure painless type changeover and mean the customer is no longer tied to strict production planning. Finally, moving on to the transmission assembly, a recently installed application comprising 3 different workcells is particularly interesting. In the first 2 workcells, installed parallel, a Cartesian manipulator unloads pieces from the die-casting unit that produces the car gearboxes. An articulated robot now takes over the handling of the piece, initially placed on a mechanical unit for inspection of the pouring basins and extractor profiles. The robot then loads/unloads a blanking unit and removes the inspected basins. The piece is kept on board, and the flywheel end surface is milled using a spindle or a cutting disc. After appropriate dimensional checks and application and checking of the DataMatrix code, the gearbox is placed on the passed/rejected piece exit conveyor, depending on the outcome of the tests performed. The robot also fits the inserts in the press; the inserts may vary from piece to piece, since the system is able to process 8 types of automatic gearboxes for both petrol and diesel engines. The downstream plant consists of 6 robots, divided into one external and one fenced zone. 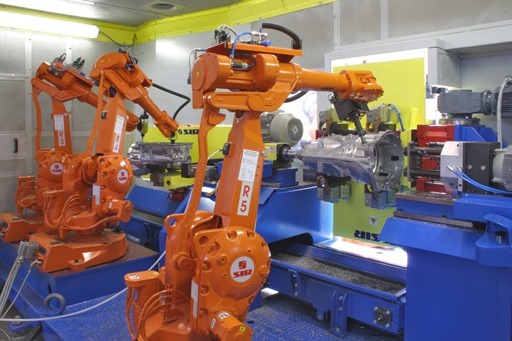 The 2 articulated robots in the external zone tend a fine blanking unit and a gearbox end surface milling unit. They then feed the pieces onto the tables where they are exchanged with the fenced zone. Once inside, the gearboxes are deburred by 3 robots fitted with air-spindles and filing tools. All the contours and windows in the piece are machined, as it is loaded first on a drilling and then on a boring unit. A fourth articulated robot sand-blasts the element before its return to the external zone. The tending robots now perform a test on the gearbox’s forms, using artificial vision, and a flushing test in which the ducts are checked on the basis of their flow capacity. After a further helium tightness test, the robots apply a TAG chip label on which each individual component’s history is recorded. After DataMatrix marking, the gearbox is finally ready to be placed on the passed/rejected piece belt. This application’s total cycle time is around 45 seconds. The results achieved in the applications described above prove that global robotisation is modern manufacturers’ answer to the demands and challenges of today’s difficult economic conditions. The integration of different technologies has allowed the realisation of plants that are now no longer created for a single purpose, but have become capable of automating entire processing sequences. These applications are not self-contained islands: they are real production stations, where subdivision into phases delivers the necessary production flexibility. SIR is a strong believer in this combination of Robofacturing and production logistics, especially in highly structured firms like automotive manufacturers.